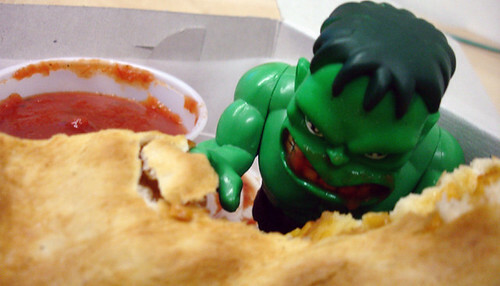 Hulk Wishing Everyone A Very Happy Thanksgiving! Another item I posted – just a little while ago – is on it’s way to being finished. It’s the Mean Green kit from dynabol. Jen, my painter, is doing a fantastic job of bringing this kit to life! The top pic is just a work in progress and far from finished – but looks fantastic so far! I can’t wait till it’s done! 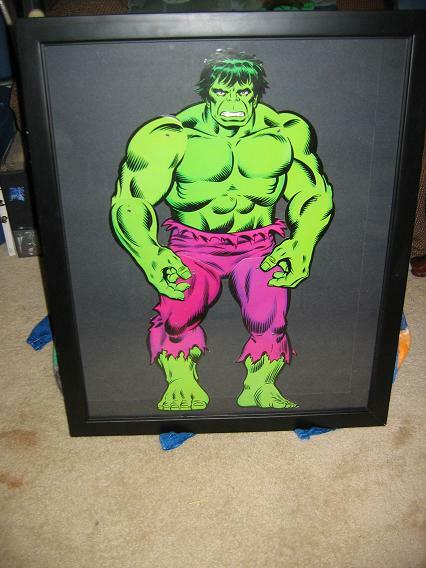 Here’s the Joint Action Hulk I posted so long ago – but here it is in a frame that I bought. I think it class’ up the piece – not to mention protects it from having any harm done to it. 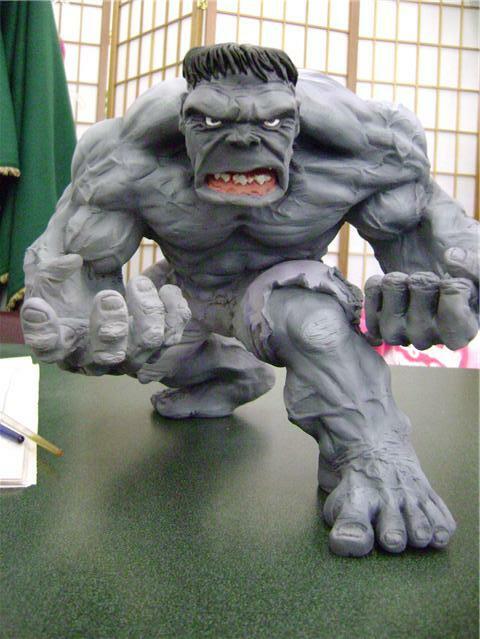 I had an idea to bring this guy around to the many conventions I visit and have the Hulk artists and writers sign him – but I decided against it. 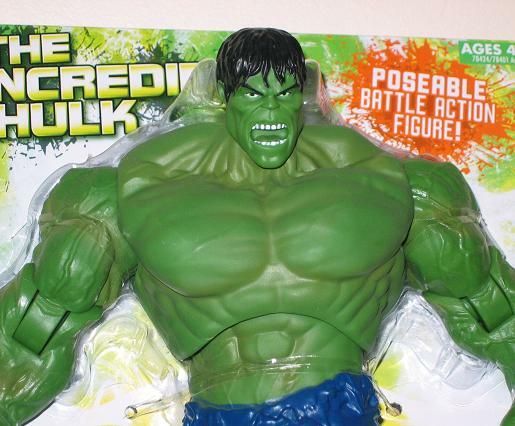 Maybe if I get a second – but this Hulk toy is too cool not to have a mint one displayed. 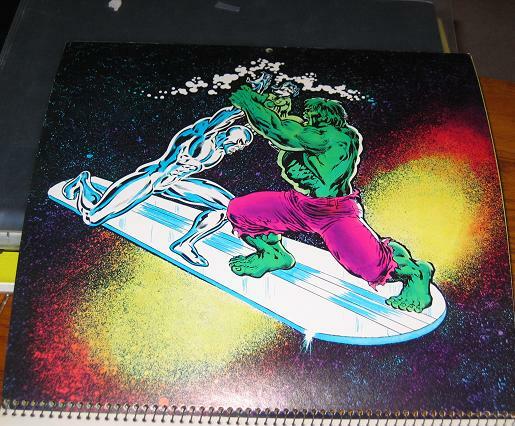 This is a calendar from 1979 – the art in this thing is freakin’ awesome! By the way, sorry this is being posted so late – I had a busy, busy day. The holidays always throw a wrench into the works. But I am so sure you guys will love this post I’m not even stressing about it! Check out the art in this! 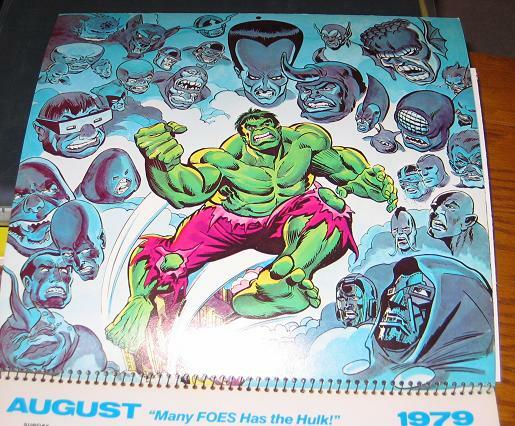 One of my favorite images is this one here of Hulk’s favorite nemisis’ Abomination and the Leader are in there – but Doctor Doom, Juggernaught, Mole Man, Bi-Beast, The Gremlin, The Rhino, Absorbing Man, AQON! Can anyone name every villian in this photo? I will give someone a real, genuine No-Prize if they can do it! And I don’t mean give them names – I name the characters names from the original comic. 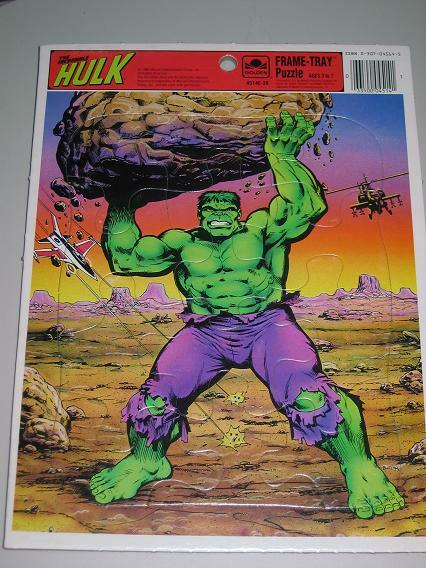 I will even give up my Hulk crown if you can name each comic that they all appeared in – without looking it up! 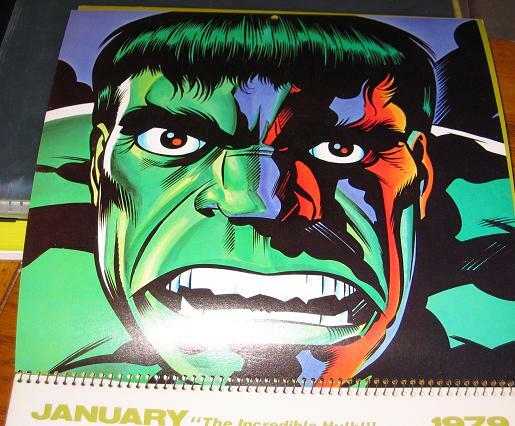 Here is my favorite image from the calendar! 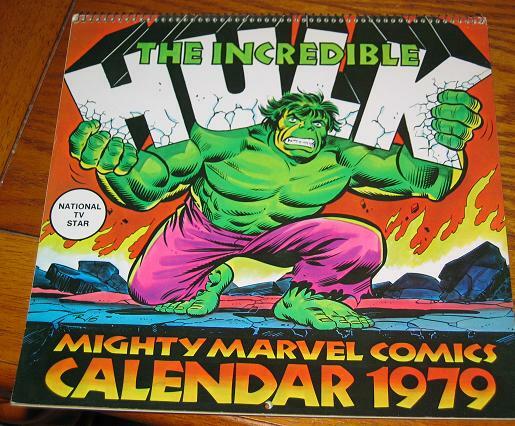 The calendars nowadays don’t seem to have the same charm as this does. The images you get are not nearly as impressive – or as big! Check this out of you ever get the chance because I didn’t even show you all the images – just my favorite! 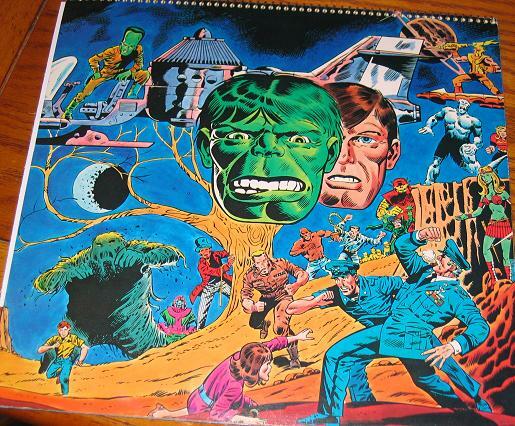 Back Cover - With Banner and more foes! 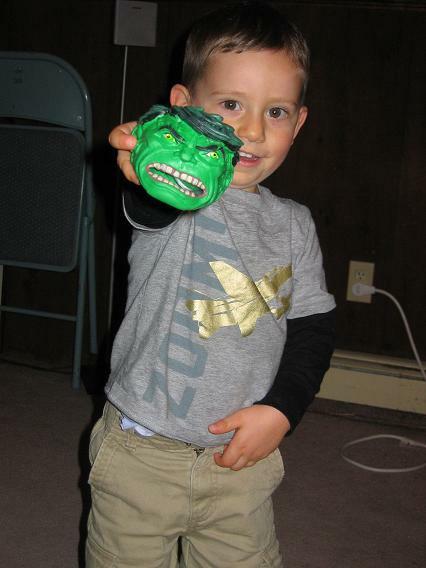 My Nephew Loves the Hulk – Part 2! What a cute kid – and here he is with his new favorite toy – that already sprung a leak so I had to cut out the inside. He didn’t care though – still loves it anyways! Thanksgiving is coming up Thursday. 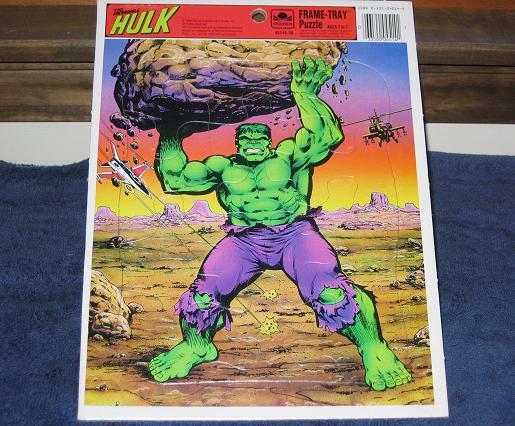 I have decided to stuff you guys full of great Hulk stuff the first half of the week since I will probably not be posting ANYTHING Thursday or Friday… sorry but I am going to be gambling Friday and either I will lose my wad or be swimming in money. Either way I don’t think I will have time to post. 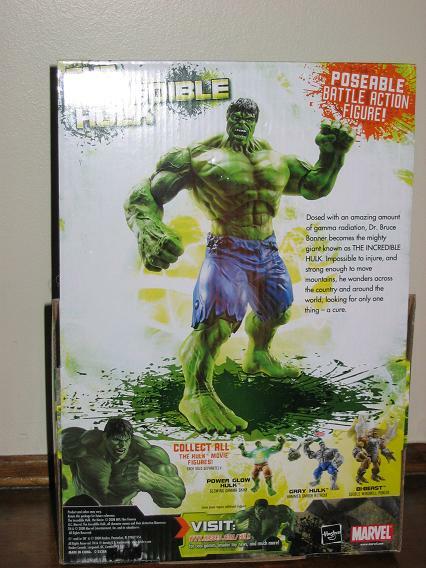 Anyways, here is the larger Hulk figure from the movie line. It’s a WalMart exclusive – although, if you can believe it, my WalMart is still bare of these. A good friend of mine had the generosity to send me one when he learned of my trouble locating one. 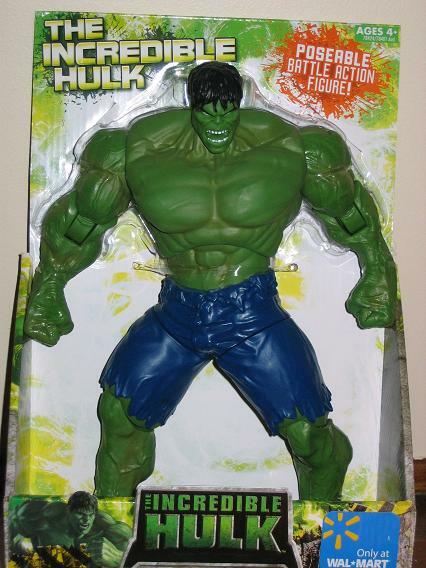 While it’s definitely the best movie figure it still doesn’t come close to the 2003 13″ figures. 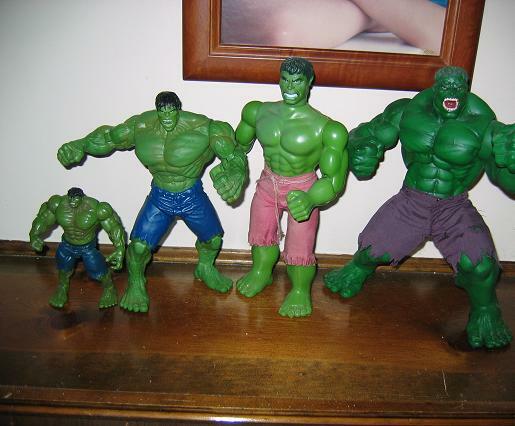 I don’t think many Hulk figures will. The other thing about this figure is that it has strange articulation points. It has no articulation in the wrists or feet or waist (?) – but in the abs, neck, knees, elbows and strangely enough – the upper thighs. Which makes for some really strange poses. Kind of strange. One thing there is no complaints with is the sculpt. What a great job was done with this! Even the paint application was done really well with these- which, as most of you know, has been the weak point for this line. The information I’ve been given is that you should keep an eye out for scratches. See, the packaging for these items are not in a plastic covering or anything – and they are shipped on top of each other (kind of in a “69” position) and in transit must scrape against each other. So just have a keen eye when picking one out! I have no real complaints about the packaging but I would have rather a full window box reminiscent of the classic Mego toys.